Trey Smith was showing off the new NBA Jam, subtitled the On Fire Edition at a recent EA gaming showcase. People were playing the new version near him while we chatted about how the new game will have better artificial intelligence. He seemed even more excited that the game is downloadable for Xbox 360 and PlayStation 3. That had been the plan for last year's versions, but they came out on disc. Download is the way to go for NBA Jam, he told me. And what does he want out of it? What would make him happy? Smith told me that he hopes two million people will download the free trial of the game. He wouldn't tell me how many people he hopes convert that demo into a full paid-for game. He just wants to hit that two million mark and says it's not unheard of. I don't know how popular downloadable demos for Xbox Live Arcade and PlayStation Network games usually are, but two million sounds ambitious. On the other hand, I speak to a lot of people who make Facebook games these days, and those folks are thrilled at the idea that millions of people might be playing their games. People don't make games not to be played, of course. Despite Smith's enthusiasm for downloadable console games, I hear from game developers who fret about flagging XBLA game sales. I look at last week's acclaimed $15 XBLA game Bastion, spott about 48,000 high scores on its leaderboard four days into its release and, frankly, can't tell if that's good or not. 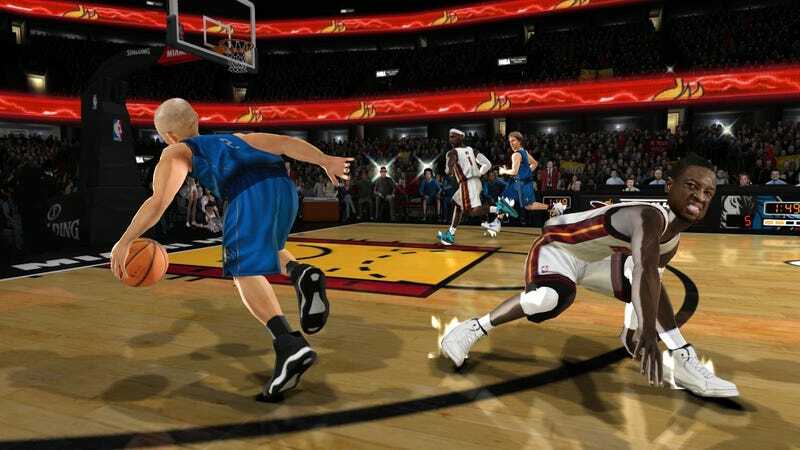 Would two million demo downloads of the new NBA Jam truly be a wonderful thing? I don't know, but as a goal it's interesting. Look for NBA Jam: On Fire Edition, complete with a roster of surprise bonus players who Smith wouldn't tell me about, later this year for XBLA and PSN.